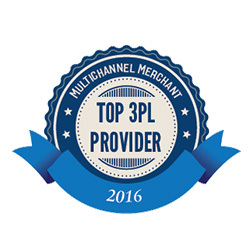 a2b Fulfillment is pleased to be recognized as a Multichannel Merchant (MCM) Top 3PL for 2016. Selected by the editors of Multichannel Merchant, this accolade recognizes the leading third-party logistics providers within the retail industry. MCM reaches key decision makers responsible for ecommerce, management, marketing and operations at companies that sell merchandise through multiple channels — including ecommerce, mobile, social, and catalog. With the growth of ecommerce, MCM felt it was important to designate 3PLs that were ecommerce qualified and experienced. a2b Fulfillment helps companies work smarter and faster by outsourcing business support services, including order fulfillment, customer care and value-added services, such as kitting and assembly and retail preparation. Its specialized solutions are designed to improve customer experience, while reducing operating costs.